Do your students present the same problems in each speech or presentation without improving? Use these FREE charts and reflection questions to help your students identify and fix their public speaking weaknesses over time! 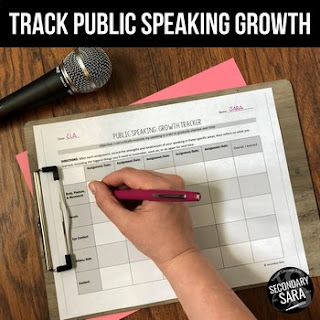 Great for assessing growth in CCSS standards like SL.1 and SL.4, these charts ask students to get and respond to feedback, self-assess their presentations, reflect on how group assignments went, and track assignments throughout the year to see if changes are happening. NOTE: The EDITABLE version of this freebie is INCLUDED in my newly UPDATED Public Speaking Activity Bundle! Check it out to get a combination of speaking tools at a discounted rate! • Visual Aids Lesson: Use before your next speech!